Well folks, I have received alot of questions and comments on my last blog about the differences between the 1964 Hess Tanker and 1960s Jimson Shell Tanker so much so that I need to write this followup article and include some additional information and be a little more specific. OK, the first thing that I need to clear up is that I stated that there were 12 Hess tanker tires and what I meant to write and be more specific is that there are 12 Hess tires under the tanker that are double and 2 single on the front for a total of 14 tires all together unlike the 6 that are under the Jimson tanker which are single tires plus the front 2 for a total of 8. I hope that helps clear up any confusion. Now, the other most commented on item is the gas pump that is shown on the front of the box (see pic). The reader went on to say that recently one sold on Ebay and in the picture it showed the gas pump and I didn’t mention that it came with one so lets clear that up as well. 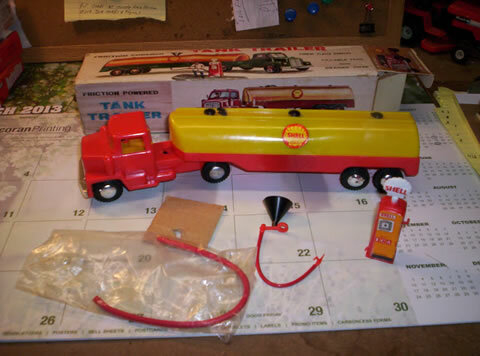 Each truck DID NOT come with a gas pump and was an item that you could purchase separately. I know this for a fact as I talked to an older collector who is very knowledgeable on Jimson Toys and he was able to confirm this. He compared this to the 1966 Hess Voyager where you might have also seen some pictures of it sitting on a display stand. Everyone also assumed that when they got a Voyager that would be included, not so. 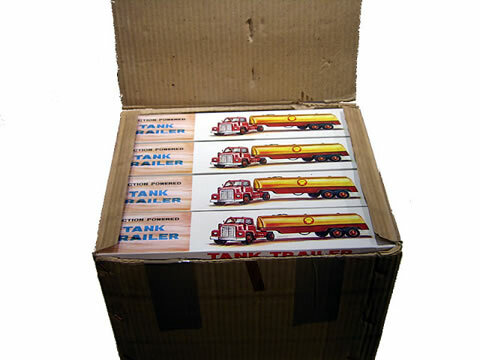 That also was an additional item that you could purchase separately.I also wanted to show you a rare picture of the actual case of trucks as well as the label on the side of the case which you can see below. If you have any other question that you would like me to address on this subject feel free to leave them in the comment section below and I will do my best to answer them. We love to hear from you! Enjoy the pictures. Jimson Tanker with mail in gas pump. (Picture from auction on ebay years ago).